I guess it’s one of those eternal debates- Delhi or Bombay? Well-done or medium-rare? The Book or The Movie Adaptation? And, the morning drink – Tea or Coffee? It’s something that just happens to you- I think that the drink chooses you, for whatever reason, and not the other way around. I’m a coffee drinker. It’s a flavour and aroma I grew up with, since my parents prefer coffee. I’ve had my share of bean-versus-leaf battles with family and friends, which was mostly me whining about why the other person couldn’t just drink coffee like a normal person. Coffee was so much easier; instant coffee+water+milk. Done. With tea, there was brewing-straining-serving-blah. But I had been fooling myself with instant coffee at home. 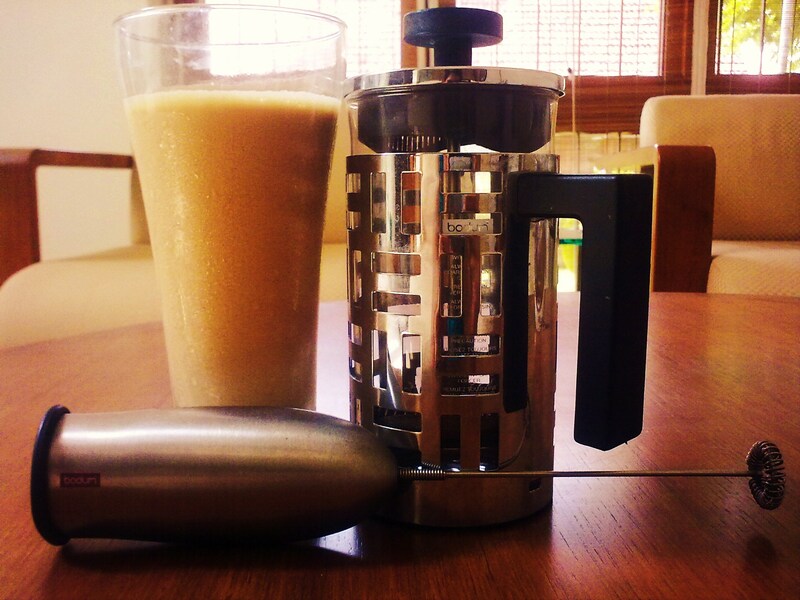 The past few months I’ve been in Kerala with my parents, and have discovered the joys of a French press. It’s sooooooo much nicer than instant coffee! Seriously, Deepika Padukone and Karan Johar can try to switch on the best in themselves with Nescafe, but it’s just coffee-bean pee compared to brewing coffee in a press. I don’t have a press in Bombay, and had been making do with various forms and flavours of instant coffee. Now, I’m addicted to the French press. I love using it. It makes me feel all phancy, (which is just a fancier way of saying fancy) and vaguely European. I’m currently using a coarse coffee blend called Mr Bean, from Tata Coffee, and we have an awesome Bodum press to make it in. It takes a little longer, but once you’re done, the decoction is lovely- strong and aromatic- and it doesn’t have that faint cardboard aftertaste. Bodum has some lovely sleek products which you must check out here if you love coffee. PS Here’s the song which inspired the title of this post- Java Jive- it’s a cover of the Ink Spots’ original. If you call my mother or brother up and give them your address I got you something to put some of that awesome Frenchied coffee into! Much love.